The annual report is produced by the World Health Organization/UN Children's Fund Joint Monitoring Programme, or JMP, which has been monitoring global progress on drinking water, sanitation and hygiene (WASH) since 1990. 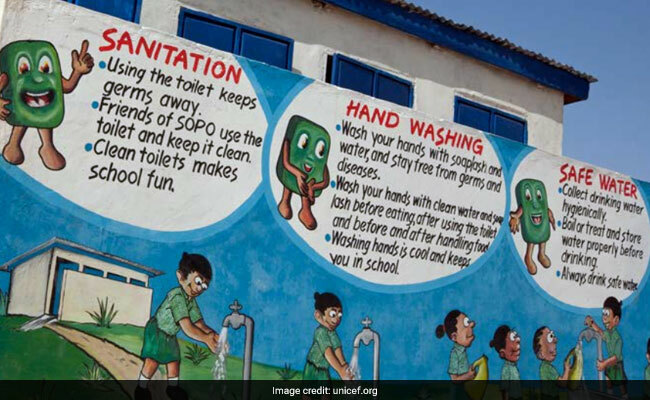 India has made rapid progress in increasing access to sanitation in schools, the United Nations said in a report, noting that the proportion of schools without any sanitation facility has decreased at a fast pace in the country. A new joint UN agency study, 'Drinking Water, Sanitation and Hygiene in Schools: 2018 Global Baseline Report,' says that good hygiene facilities in schools provide the basis of a healthy learning environment, and that girls are more likely to attend when they are on their period. It said India "has made rapid progress in increasing access to sanitation facilities in schools." Between 2000 and 2016, the proportion of schools in India without any sanitation facility decreased even faster than the proportion of the population practising open defecation, it said. The report said that a recent survey in India also collected information on the availability of facilities for menstrual hygiene management. The proportion of schools with bins with lids for the disposal of sanitary materials varies widely across states in India, from 98 per cent in Chandigarh to 36 per cent in Chhattisgarh. Mizoram is the only state where more than 50 per cent of schools have a functional incinerator for the disposal of sanitary waste. It said the Government of India issued national guidelines on menstrual hygiene management in 2015 but a survey in 2016-2017 showed that only two thirds of schools in India provide menstrual hygiene education with wide variations between states. The report further said that millions of children globally are going to school without basic hygiene facilities, and the goal of universal access to basic water, sanitation and hygiene remains "a huge challenge". Over 30 per cent of schools worldwide do not provide safe drinking water; a third of schools do not provide the most basic of toilet facilities (such as septic tank, pit latrines or composting toilets); and nearly 900 million children go to schools with no handwashing facilities with soap and water. Global Chief of Water, Sanitation and Hygiene at UNICEF Kelly Ann Naylor said that if education is the key to helping children escape poverty, access to water and sanitation is key to helping children safely maximize their education. "To neglect this is to be careless with the well-being and health of children," Ms Naylor said. Universal access to basic water, sanitation and hygiene in schools is part of the 2030 Agenda for Sustainable Development, but achieving this ambitious target presents a huge challenge. The JMP has designed tools to make it easier to track progress across countries, towards a basic level of drinking water, sanitation and hygiene service.